Global energy production has increased over the past decade, from 15,409.0 TWH in 2000 to 23,536.5 TWH in 2014. This has also led to the increasing need for expanding T&D networks globally; new T&D infrastructure needs USD 1.9 Trillion in cumulative investment by 2024 to meet the growing energy demands. This includes substations, power lines, and associated equipment and new technology. Governments worldwide are investing in T&D network expansion projects, increasing the demand for power transformers. The power transformer market is projected to reach USD 29.9 Billion by 2020, from USD 20.7 Billion in 2015, at a CAGR of 7.6% during the forecast period. For company profiles, 2014 has been considered. Where information is unavailable for the base year, the prior year has been considered. The data has been triangulated by studying various factors and trends from both the demand and supply sides. Along with this, the market has been validated using both the top-down and bottom-up approaches. This report caters to the requirements of certain stakeholders in the power transformer market which include power transformer manufacturing companies, utility companies, industrial associations, and private equity investors among others. Power transformer market is projected to reach USD 29.91 Billion by 2020, from an estimated USD 20.71 Billion in 2015, at a CAGR of 7.6% from 2015 to 2020. Governments worldwide, due to the rapid increase in electricity demand, are not only focusing on raising generation capacities but also emphasizing on improving T&D infrastructure. The global electricity demand is projected to grow at an annual rate of 2.4% from 2009 to 2035. Investments have been high in power transmission & distribution sector in developed as well as developing countries. Currently, small power transformer is the largest segment of the power transformer market, primarily due to its use in various applications. However, large power transformer is the fastest growing segment. With countries emphasizing on reducing transmission losses, the use of high voltage transmission technologies such as EHV, UHV, and HVDC has also gone up. Oil-cooled power transformer segment is projected to hold a larger market size as compared to air-cooled power transformers. This is due to the fact that oil-cooled power transformers are considered safer while dealing high voltage applications. With growing high voltage transmission network expansion activities, the oil-cooled power transformer market is expected to grow at a higher CAGR during the forecast period. Asia-Pacific was the largest market for power transformers in 2014, and is expected to dominate the market till 2020. Europe is the second largest market, partly due to the replacement of aging infrastructure activities going on in the region. Meanwhile, Asia-Pacific is also the fastest growing market for power transformers, as the region is witnessing some of the largest T&D expansions being carried out due to rapidly increasing demand in countries such as India and China. The demand for power transformers is increasing globally because of numerous T&D expansion projects and grid interconnection projects between countries. Siemens AG (Germany) is constructing a USD 450m high-voltage direct current transmission link between Ethiopia and Kenya. The Ethiopia-Kenya Power Systems Interconnection Project will be roughly 1,000 kilometers long and will transmit hydroelectricity. Five South American countries (Chile, Peru, Colombia, Ecuador, and Bolivia) are seeking to interconnect their energy systems in search of better regional integration. For Europe to reach its targets for 2020 and 2030, a massive expansion of the power grid is required. All over Europe, there is a significant need for improved and integrated transmission lines, carrying more power. In addition, transition into renewables requires new lines and a restructuring of the grid, to transfer electricity from the place of production to usage. In order to fully optimize the potential of renewables, a better integration of energy markets is also required to exchange electricity across borders. However, reluctance of governments worldwide in taking up capital incentive projects can hamper the power transformer market. Grid stability and reliability have driven new investments and overall spending in the transmission and distribution markets, with fewer major outages occurring in recent years. Despite a strong focus on grid infrastructure renewal, especially in Europe, there has also been significant expansion of the grid network. In 2011, the total installed transmission and distribution line length reached 69.5 Million kilometers; in 2016, that figure is set to reach 74.2 Million kilometers. In 2011, Capital Expenditure (CAPEX) in transmission and distribution rose to USD 190.21 Billion, and is forecast to increase to USD 231.83 Billion by 2016. There is an ever-increasing capital spend as seen in previous years during the replacement of existing technology with higher-end smart ones. 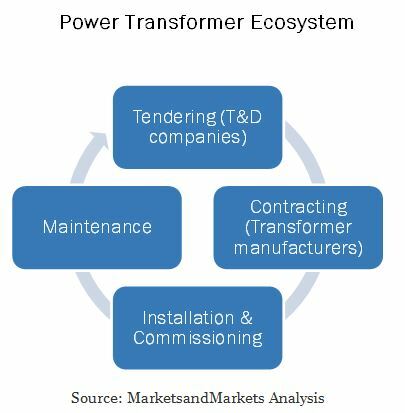 The power transformer market is largely controlled by four major market players including ABB (Switzerland), Siemens AG (Germany), General Electric (U.S.), and Toshiba (Japan), which control nearly half of the overall market. These companies have the advantage of having large scale manufacturing operations which cater to major T&D network expansion hotspots such as the Middle East and Asia-Pacific among others. 10.7 Hyundai Heavy Industries Co., Ltd.
10.11 SPX Transformer Solutions, Inc.